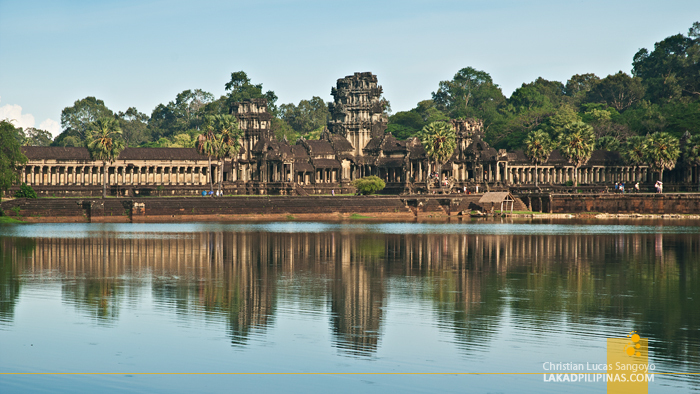 Angkor Wat, the name evokes a combination of Indiana Jones, Lara Croft and books. I have read and heard about this temple during my History of Architecture classes way back in college, have memorized its name en route to exams; and now finally, years after, I’m gonna see it with my own two eyes and feel its rough stone columns with my own bare hands. 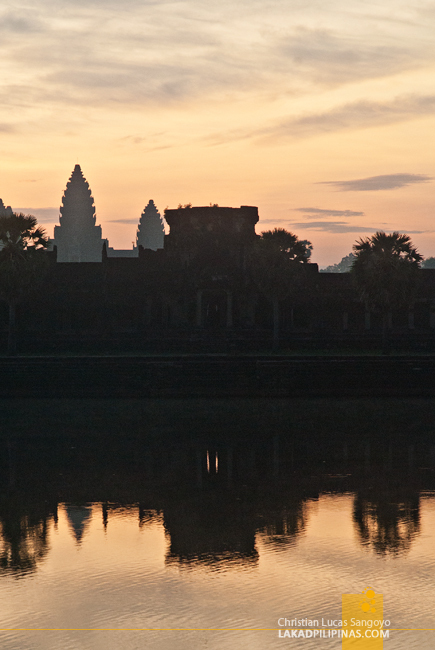 The first time I laid my eyes on Angkor Wat was on a late Sunday morning. It was during the early month of February and it was a holiday. Instead of stopping and walking into its 190-meter long sandstone bridge and crossing over its mighty moat, I instructed our tuk-tuk driver to speed on and proceed to our next temple. There were just too many people. Hordes and hordes of visitors making some sort of pilgrimage to a tourist Mecca. We returned that same afternoon. There were still a lot of people, but quite manageable compared to the melee earlier in the day. Crossing the moat, we were quite excited with the prospect of visiting the largest religious monument in the world. 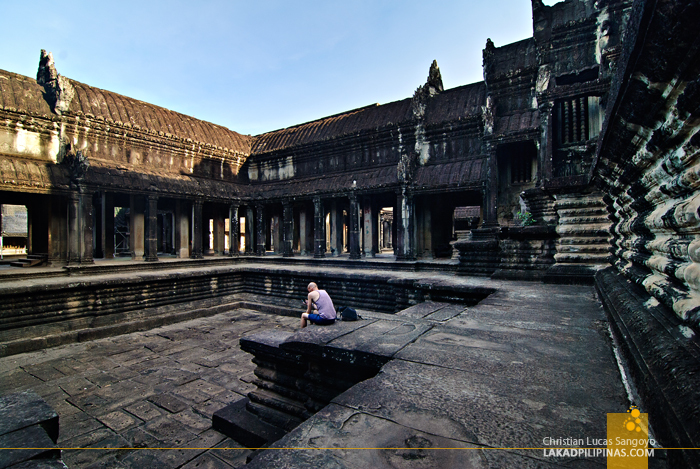 Angkor Wat, which literally translates to Capital Temple, is a Hindu temple built by Khmer King Suryavarman II during the 12th century. 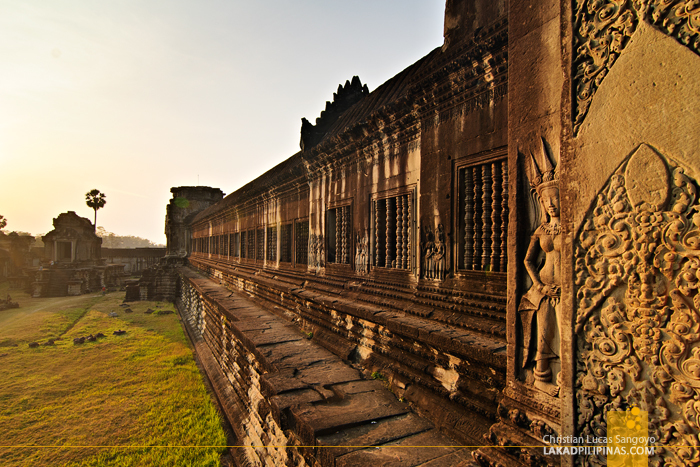 It was later converted into a Buddhist temple by the Great Builder, King Jayavarman VII after he ascended the throne. Unlike most temples which are dedicated to Shiva, this one is dedicated to Vishnu the Preserver. 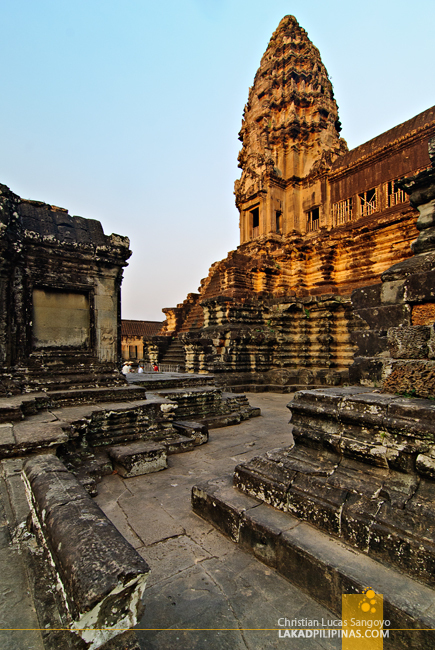 It was said that it was built not only to be used as a state temple, but also to serve as a mausoleum to the king, hence its unusual western orientation. 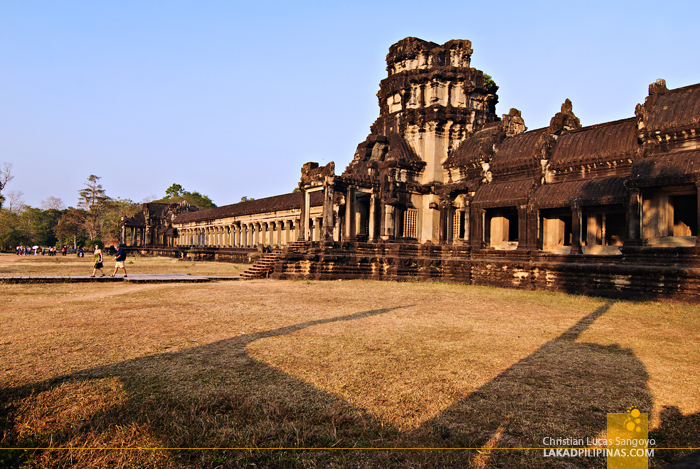 While not as massive as Angkor Thom, the site sits on an impressive land area of 820,000 square meters. It is enclosed by a moat, which still exists up to this day, and has only a single entrance at its bridged west gate. From its plan, one can see that there is another land entrance on its east side, although that part is not accessible to the public. 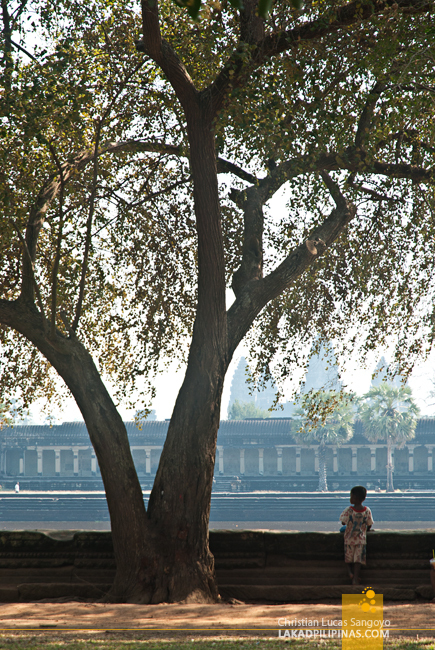 Touring Angkor Wat is not the easiest thing to do. 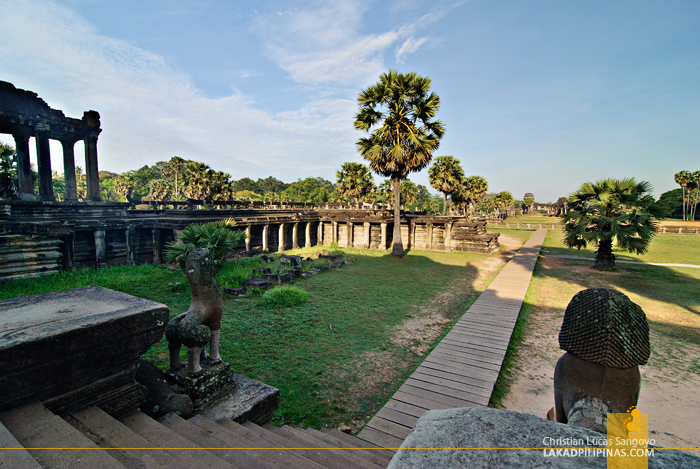 Being a combination of a Khmer temple-mountain and galleried-temple, it’s easy to lose one’s direction and wander aimlessly about. The temple is divided into three rectangular galleries, each one raised some meters above the next which would eventually lead you to the center of the temple. One can easily notice how steep the stairways are in the temple. It was said that these were by design and were to symbolize the challenge of ascending the kingdom of gods. The temple represent Mount Meru, a mountain populated by devas in Hindu mythology; its walls symbolizing the mountain ranges, and the moat, the ocean. Walking around its galleries, we can’t help keeping our mouth from falling open. 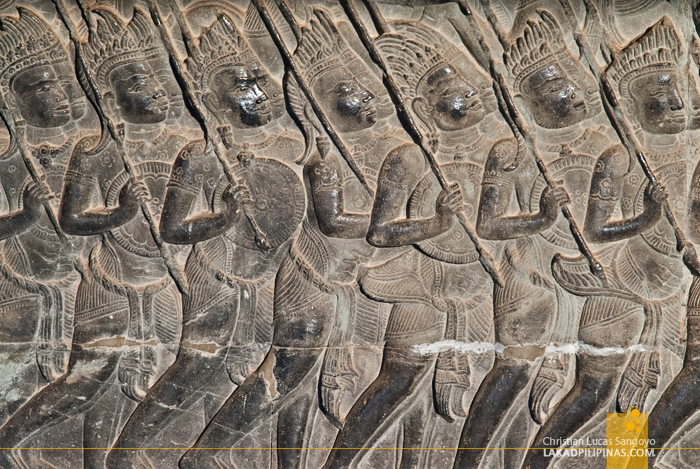 The bas-relief carvings at Angkor Wat are simply unbelievable. The very fine craftsmanship and its massive scale were something I cannot believe human hands can possibly do. I’m a skeptic when it comes to ancient aliens, but seeing this in person, I can'tt help but wonder if there’s truth to the legend. Professor Charles Higham once referred to it as the greatest known linear arrangement of stone carving. Exploring further, we found ourselves at the upper level of the temple where five towers, arranged in quincunx stood, their pinnacles bathed in the late afternoon light. These represent the five peaks of Mount Meru. The place is packed with visitors, who probably thought as we did that visiting the temple later in the afternoon would be better than fighting it out with the morning crowd. 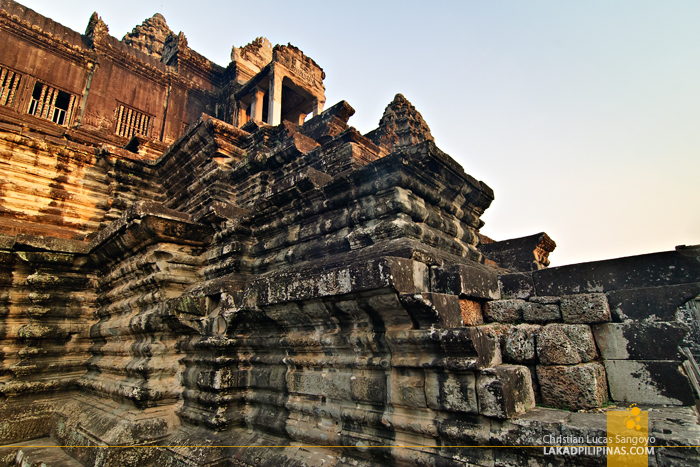 Angkor Wat’s central tower, which rises 43 meters from the upper platform, is speculated to have housed the king’s funerary jar. These five towers, which are shaped like lotus buds are mostly off-limits to tourists. And although they were impressive in their own right, we were not really that awed compared to the towers we saw in Prasat Bayon. Well, Angkor Thom and Angkor Wat are two different animals anyways. While the former employs an almost baroquesque technique in construction, where everything is grand and massive, the latter has a more refined approach to its architecture, employing an almost classical refinement, constraint and balance to its design. 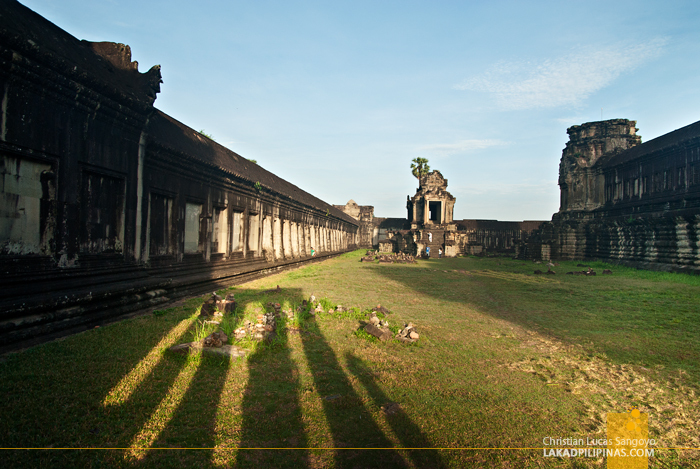 What Angkor Wat lacks in grandeur and massiveness, it makes for in its details and symmetry. 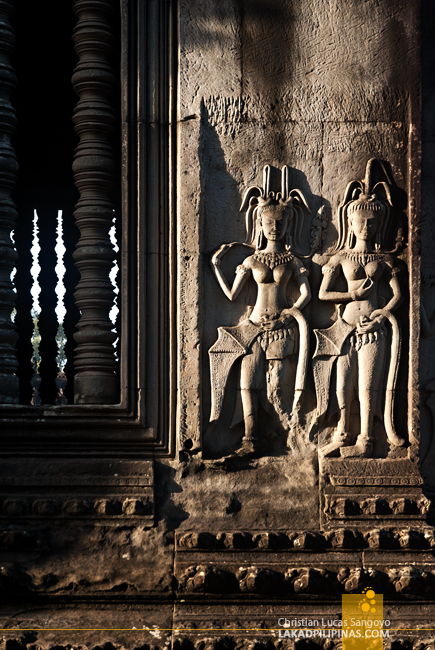 And one can see that on the immense number of carvings covering most of its walls and columns. 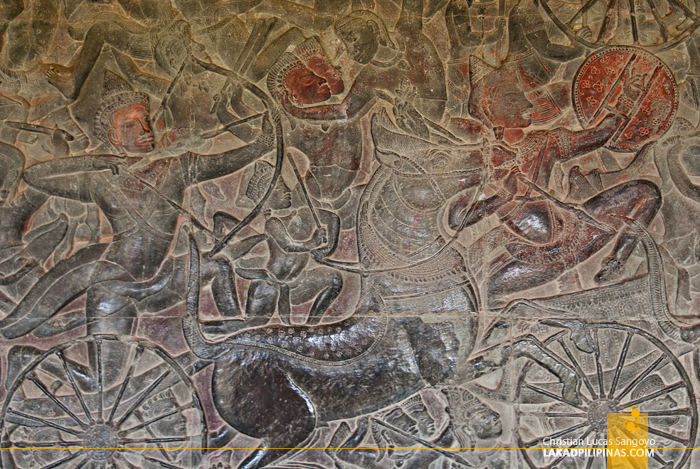 The amount of artwork carved in stone in the temple is simply staggering to the point of overwhelming. By the time we finished exploring all the nooks and crannies we can squeeze ourselves in, the sun decided that it had had enough and started to hide below the plains of Siem Reap. It was almost fully dark when we re-crossed the naga-laden bridge, our only light the afterglow of the retreating sun. 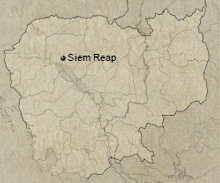 We did return to Angkor Wat during our second visit to Siem Reap. 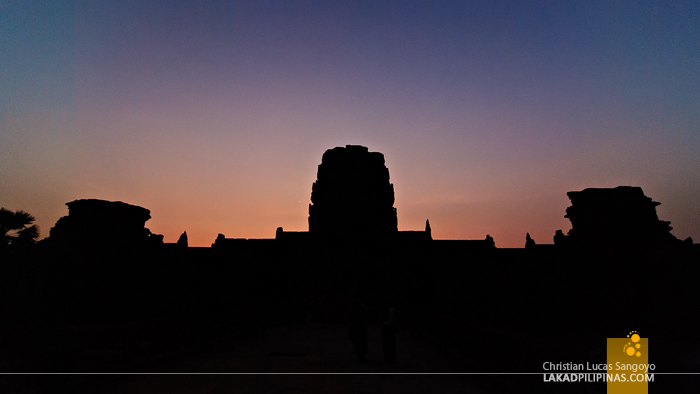 This time, we sacrificed our party time in Pub Street and went home early just so we can catch the famous Angkor Wat sunrise. While I initially thought it to be overrated, I was wrong. It was worth getting up early to see this majestic temple framed by the morning rays of the sun. And what’s more, after the sun rose higher, most of the tourists would leave, going back to their hotels or wherever, and you can actually roam the temple, unimpeded by pedestrian traffic. 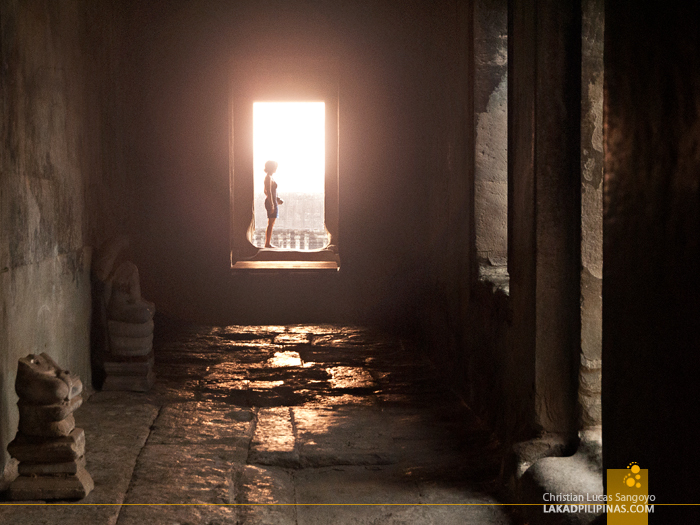 It actually gave Angkor Wat a whole new light. I infinitely liked it better the second time around.